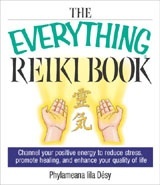 Written with the beginner in mind, <a href=”http://www.amazon.com/exec/obidos/ASIN/159337030X/phylameanalilade/&#8221; target=”_blank”><strong>The Everything® Reiki Book</strong></a> is a practical approach to all-around wellness for the body, mind, and soul. <strong>About the Author</strong> Phylameana lila Désy is a Reiki Master/Teacher who operates her own home-based healing practice. She is certified in Usui Shiki Ryoho Reiki and the Science of Intuition from the Holos Institutes of Health. She also runs the popular <a href=”http://healing.about.com/&#8221; target=”_blank”>Holistic Healing Web site at About.com</a>. My dear, I am so desperate I am ready to try anything. I had decided to commit suicide but I remember this is just equivallent to stalling. I will have to come back to this earth of ours. I am a trained Systems Engineer, 73 years of age unnemployed, homeless. Will inherit a fortune when my sisters sell our estate, mean time must struggle to elp ends meet. Help. I am wondering if you could do some distance Reike healing on me?